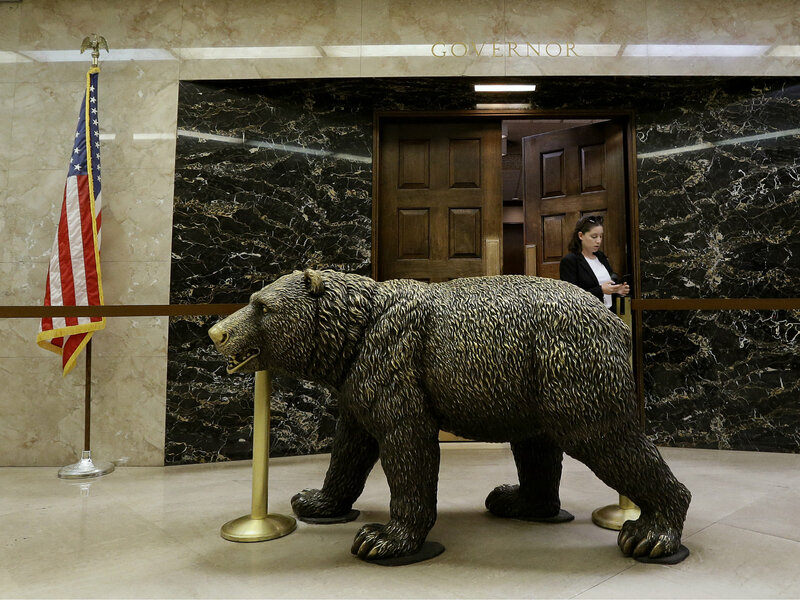 A bronze statue of a bear sits outside the governor's office in the office building attached to the Capitol, Thursday, June 14, 2018, in Sacramento. Even though California lawmakers passed a $139 billion budget last week, more votes remain this week to implement spending on homelessness, health care, affordable housing and a variety of other budget priorities that require policy changes. The Legislature approved a budget bill that creates an online community college, funded with more than $100 million for start-up costs, and then $20 million annually in coming years. The bill calls for the college to offer practical career-training programs for adults, which will provide certifications or short-term credentials. California lawmakers will continue the state’s Film and Television Tax Credit through 2025. It would have expired in 2020 without a vote. The credit gives back $330 million each year to films and television shows that stay in or relocate to California. Republican Assemblywoman Marie Waldron argued money from films trickle down to hotels, caterers and other service industries. “The industry really helps propel, almost like a ripple effect, hundreds, even thousands, of other ancillary businesses,” she said, recalling her time working for NBC Sports. Lawmakers first created the credit in 2009 to stop productions from leaving for lower-cost states with heavy industry incentives. The state’s non-partisan Legislative Analyst’s Office has found the credit has helped achieve that goal, but fiscal groups across the political spectrum — from the conservative Tax Foundation to the liberal Center on Budget and Policy Priorities — have questioned whether the extra economic activity outweighs lost tax revenue. After a noisy push for single-payer health care divided California Democrats last year and spawned months of hearings and discussions, the new state budget contains little to mark that debate. The state Senate passed the single-payer health care bill last year, which led to the state Assembly halting it over major unresolved funding questions. During budget negotiations this year, the roles were reversed. The Assembly proposed a first step toward universal health care coverage by expanding Medi-Cal access to undocumented immigrants. The Senate prioritized other funding, such as raising welfare payments. Ultimately, the other priorities won. The bill that implements health care funding instead spends $5 million on a new study group. It must report back in 2021 about how to get to universal coverage. Democratic state Sen. Ricardo Lara, an author of the single-payer measure, voted against the bill. “We could have and should have made a prudent investment toward making health care a more human right in California, by expanding Medi-Cal to our immigrant population,” Lara said, endorsing the Assembly’s approach. All of the trailer bills passed and head to the governor for his signature. State Senator Holly Mitchell (D-30, Los Angeles) returns to Insight to discuss California's new spending priorities in the next budget. (AP) — State lawmakers approved a $139 billion budget Thursday that uses California's massive surplus to boost funding for homeless programs, welfare, child care and universities while also socking some money into savings.